Andy Small is living proof of the London 2012 legacy. 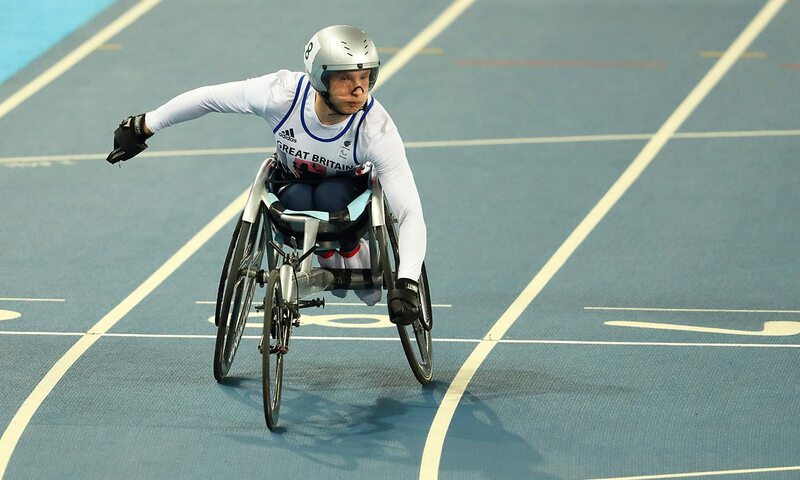 The 24-year-old went to watch the Games with a mild interest in sport but was inspired enough to take up wheelchair racing and went on to win a medal over 100m in Rio last year. Speaking during a visit to St Mary’s Catholic School in Astley near Manchester where he was talking to youngsters about this summer’s World Para Athletics Championships in London, Small says he was a self-confessed “coach potato” in 2012 but was so inspired by the exploits of Hannah Cockroft and David Weir amongst others that he began to look into how to get into the sport. The Nantwich athlete hooked up with coach Rick Hoskins in Stockport. “Rick told me he’d seen more meat on an Oxo cube when I first started,” Small says. “So part of my training in recent years has involved trying to become stronger and I feel I’ve been in a period of transition. “I train six days a week and am keen to keep healthy and develop as a person,” he adds. Small’s first competition was at the old Don Valley Stadium in Sheffield and he has gone from strength to strength. “It’s changed my life,” he says. Last year he was third in the T33 100m at the Rio Games. Now, he is aiming for London 2017. “I need to keep building up my strength and working hard,” says Small, whose ambitions in wheelchair racing are in complete contrast to his name.